Also the original version of SC1 had/has some limitations due to the data of its creation, so it is impossible to see in it abilities with improved logic and graphics. In my opinion, SCMR - it is the same maps and the same (basic) units as in SC1, but on the new engine with the possibility of using (optionally, of course) new abilities (say, ability for Dark Templars with teleport and auto-cast from SC2) which can be added like in SC2 (i.e. extra-bonuses in campaign) or even new heroes (the thing you did already in the version 7.0 - nice feature; like new feature with commanders in SC2). If one wants the original SC1 just with better graphics - there is already SC1 Remastered from Blizzard. I think so. Yo check out this Remastered Raynor portrait and models! You should use these! The Starcraft: Mass Recall 7.0 release is getting close, and we're looking for a few brave souls to try out the new brutal difficulty setting for a short period of time. We want to get this started ASAP so you can expect to have access to the files sometime this week. Be advised: this difficulty is meant to be unforgiving and won't be for everyone. You should expect to have a hard time. 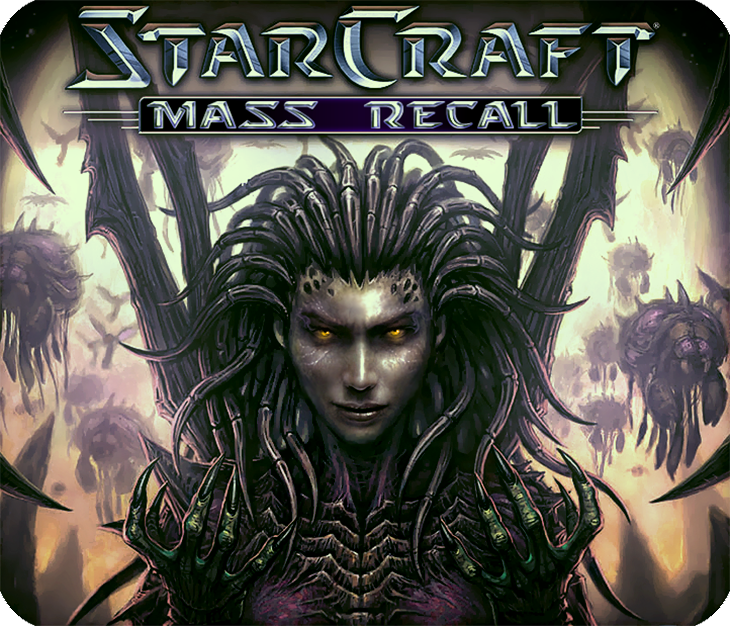 We would hope you have previous experience in Starcraft 2 at the very least, preferably also in Mass Recall or Brood War. Having completed or even played some of MR on hard difficulty is certainly a plus. Preferably Episode I. About me and SC2: all achievements in WoL and HotS, about 90% in LotV (the last - due to existing of SCMR and my sub-mod for it, so now I am playing ONLY as I wish). Sure thing. Can you play without the mega-abilities, though? We're trying to find out how brutal the difficulty is in normal circumstances, without any extra help, after all. Ah. It sounds like Stukov took control from Kaloth then? Or at least they decided to join together to get revenge. Also the HotS campaign sorta implied the cure was already failing which is why Stukov was given to the Moebius Foundation....then they seemed to have accelerated the re infestation. That of course leaves the question of what Stukov, Jim, and the Protoss were up to before he was given over to Moebius. Maybe Stukov was helpin out Zeratul before signs of reinfestment showed up. Hence his knowledge of Amon. BTW, Omega since you no longer seem to visit your redux page (for obvious reasons after what you said) I just wanted to tell you that your Enslavers campaign is awesome. Some might say it's wordy but as a someone who appreciates lore, I had a fun time with all the references. Great job. Can't wait for the mercenary remakes. Hopefully they're more beatable than the originals. A story about how Stukov escaped Duran would be cool. Also the fate of Koloth would be interesting. Maybe Koloth tried to get his experiment back. Thanks man. I'm still updating Enslavers for this release. It'll be fully SCMR 7.0 compatible with new updates all around. I'll make an update and post the standalone on the Enslavers Redux page when its done, or, it can be played via the "Extras" in SCMR too. All options are now SCMR compatible, which leaves the Enslavers Redux Campaign Launcher just a place to choose missions and view your hero/campaign progress as well as achievements. Kaloth is said to have been destroyed when the Protoss "purified" the snowy place Stukov was at before he was de-infested. I do want to add a bit of context for how Stukov came to be infested, de-infested, then infested again and knowing of Duran, Skygeir Station, and Amon. I had thought Blizzard would release some bonus Stukov Series campaign, but I guess that ship sailed. Hello, please upload Auto Install files again, so i can easy install it. Manual Install are difficult for me. Thank! I tried to contact the dev, but he didn't replay. I mean is, please re upload Auto Install of Mass Recall instead of Manual Install. That would help me. DO NOT CREATE an ISSUE in the issues section just because you lack the basic reading skills to do a manual install. That is not the purpose of that forum. Chill, he could be playing on Starter Edition, which can't run maps from Map Editor (and thus, can't do a manual install). I still don’t think it deserves an issue thread. But that’s definitely a valid point. Omega: Will the new mass recall work with enslavers redux? Was planning on playing your enslavers campaign after the end of the semester. Should I start or wait for "soon"? Wait for "soon" :) This update includes Enslavers Redux in the extras, and thus, ER will ONLY work with 7.0.0 in the future. Anything new and exciting coming to Enslavers or is it roughly the same as the current version? Got it. Thanks Omega. I appreciate the tip.